Don't waste your money renting a BottleLess water cooler dispenser! Own it and save $$ Thousands! The beautiful Stainless Steel cabinet, high capacity BottleLess water coolers (sometimes called a "point of use" cooler) is designed for offices, warehouses, factories, waiting rooms, gyms - and homes. This cooler comes with everything you need for pure, delicious water - our high capacity purification system & set-up kit. The coolers use a standard electrical outlet and are perfect for typical usage of up to 30 people. COLD WATER: The COLD water is dispensed at the perfect temperature to cool you off on a hot day between 40 and 44 degrees. However, you can adjust the cold temperature with the thermostat. STEAMING HOT WATER: The steaming hot water is great for tea, hot chocolate, soups and instant oatmeal. The child-resistant hot faucet is easy for adults to use, but helps protect small children. The hot water function can also be turned off. STAINLESS STEEL RESERVOIRS: Inside, there are 2 sealed, 100% stainless reservoirs - one holds your cold water and the other holds your steaming hot water. Stainless is better for 3 reasons - it chills and heats faster, it keeps your water pure - and it lasts for years and years. BEAUTIFUL - AND STRONG: The exterior cabinet is made of hard ABS and stainless steel. The MW1-SS measures 40″ inches high x 12″ inches wide x 12.5″ inches deep. CERTIFICATIONS: This cooler has both UL & Energy Star. INCLUDED PURIFICATION: Our Twist-Off proprietary purification is the ultimate in "user friendly" water filtration. This 1-micron filtration system is certified for 1,200 gallons for chlorine, lead, cysts, bad taste and odor reduction. Replacement of the filter cartridge is completed in seconds. THE COOLER SETUP/INSTALLATION KIT: The kit includes a lead-free stainless steel saddle valve, 25′ feet of food-grade, flexible ¼" waterway and step-by-step instructions as well as online videos to make sure everything goes well. 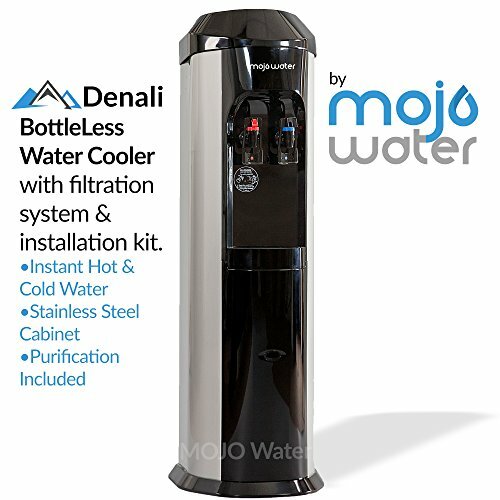 If you have any questions about this product by MOJO Water, contact us by completing and submitting the form below. If you are looking for a specif part number, please include it with your message.